Congratulations to Pacific Northwest National Laboratory's Dr. Xin Sun, who received the prestigious Alumni Society Merit Award from the Department of Naval Architecture and Marine Engineering at the University of Michigan. The award recognizes Dr. Sun for her outstanding professional achievements and her contributions to the society. Dr. Sun has a broad range of experience in the areas of applied mechanics and computational materials. Her expertise lies in applying the mechanics and materials' basic principles in solving practical engineering problems associated with solid oxide fuel cell design and analyses, advanced laminated armor materials development, joining and forming of advanced lightweight materials for automotive and heavy vehicle applications, advanced high strength steel modeling development, and lightweight automotive glazing design and development. 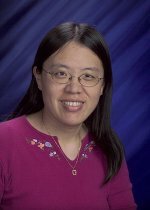 Dr. Sun, a Staff Scientist in PNNL's Computational Sciences & Mathematics Division, received her undergraduate degree in naval architecture and ocean engineering from China's Shanghai Jiao Tong University in 1990. She then went on to earn two master's degrees and her doctorate, all from the University of Michigan at Ann Arbor.